MTBO is Mountain Bike Orienteering. This involves orienteering on mountain bikes along tracks in rural bushland. The tracks are a combination of fire trails and single track. You will need to be able to both navigate and ride a mountain bike. You can purchase a special map board for your mountain bike which enables you to navigate at the same time as riding the bike. There is an MTBO "super series" which is held each year which is organised by Mountain Devils, Newcastle and Garingal clubs. Garingal Orienteers has some very keen mountain bikers in the club and Garingal organises one of the super series events each year. 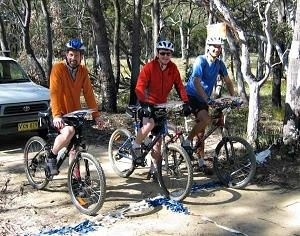 MTBO is organised as part of Orienteering NSW. There is also the Australian Mountain Bike Orienteering Association and some clubs specialise in MTBO. Each year the World MTBO Championships are held, usually in Europe. So if you don't like running but love riding a bike, get into MTBO.